Mitch (Terry Serpico) is back from a leadership training. He and Amanda (Jessica Lundy) discuss a case of insurance bilking; overcharging insurance companies for medical treatments not rendered. 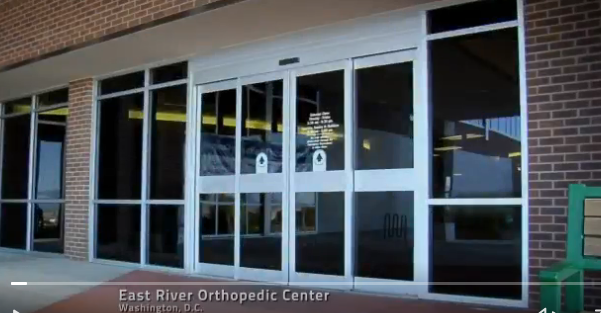 Eastern River Orthopedic Center comes up as one of the facilities involved. Preston is working out when Noah (Harrison Knight) and Veronica (Erica Marie Sanchez) enter and don’t hear them because he has headphones on. Veronica turns up the volume to get his attention. She is surprised to hear Preston’s voice and asks what he’s listening to. Preston explains that he recorded his own voice to motivate himself while he works out. They want him to go to the movies with them but Preston tells his friends he can’t because he has a whole day of physical therapy ahead of him. Although she appreciates how motivated Preston is, Veronica encourages the importance of balance. And Noah calls it cinematic inspiration. Mitch speaks with a Kathryn Jacobs and she tells him about the questionable charges from East River Orthopedic Center.That evening when she returns home, Amanda thinks she’s speaking with her son who’s in the other room until Preston comes out and asks who she was talking with. He explains that he uses his voice to motivate himself because he doesn’t feel his therapist Jay is pushing him enough. The next day, Mitch and Amanda arrive at East River Orthopedic Center and question Charlotte Cochran about the charges the therapy place billed the hospital. They ask to see a copy of the patient invoices. She tries to stall by saying she can’t release confidential information. The postal inspectors then present her with a subpoena and Mitch gives her his business card. After the postal inspectors leave, Charlotte tells Jay Greene, the man posing as Preston’s therapist she thinks they may have a problem. Jay assures her things will be okay. He swiped his doctor’s prescription pad and tells Charlotte he’ll just write some phony prescriptions and say the hospital loss them. Charlotte then calls Mitch and tells him new hire Jay Greene must have misplaced the paperwork. Later, Jay meets with Preston at University Grind and tells him therapy can’t be rushed. He explains how he was injured himself in a motorcycle accident and pushed himself to recover. Noah and Veronica enter and Jay leaves. They tell Preston they feel second and third in his life. Noah wants to do rock, paper, scissors to determine the second and third positions. Jay comes to Amanda’s office. He learns she’s Preston’s mother. He shows Mitch and Amanda a prescription for sessions billed for a patient named Stephanie Rogers. Mitch asks for Jay to send him a couple of the prescription. After Jay leaves Amanda’s office, she tells Mitch that they’ll get Georgia to do a handwriting comparison with the doctor’s other written prescriptions. Afterwards, the handwriting comparison proves conclusively that two different people wrote out prescription. They also learn East River Orthopedic Center has been billing patients for twenty sessions when only ten are taken. Amanda’s furious Preston was billed for more sessions than he actually had. Later at home, she tries to get him not to go back to the therapy center but because she can’t give him the reason, Preston refuses. The next day, a grand jury indicts Jay and Charlotte on 200 counts of mail fraud. They try to flee from East River Orthopedic Center but it’s too late. Jay and Charlotte are arrested by Mitch before getting away. He tells them that just got a prescription for jail time. At the Wainwright house that night, Preston tells Amanda he likes his new physical therapist and apologizes for not trusting his mother about not seeing Jay. The next day, Preston finds Noah and Veronica made him a motivational tape where Noah’s the voice of Preston’s conscious and Veronica’s a seagall. Preston decides to take a break from his therapy workout to spend time with his friends. CBS The Inspectors episode “Diagnosis: Negative” focused on how health care fraud costs taxpayers $80 billion per year.